We’re in that weird limbo where the weather is starting to feel like fall but it’s still fairly warm out. 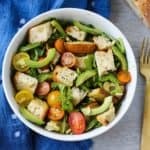 Since soup weather isn’t really in full swing, I thought I’d share my favorite fall flavors in salad form! 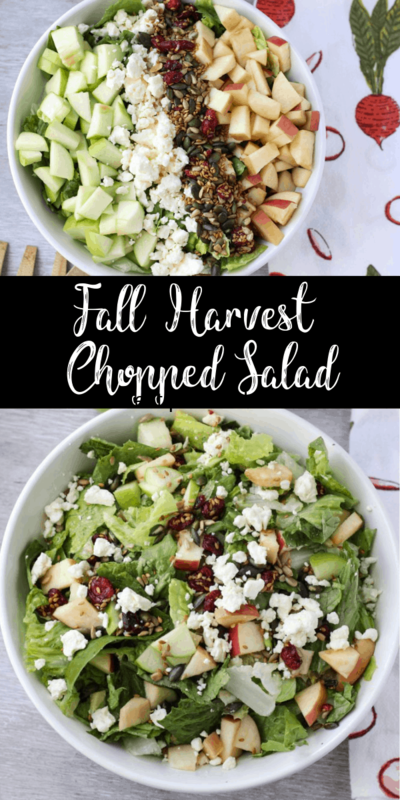 Since this chopped harvest salad is part of my 15 minute dinner series, you know it comes together quickly! It’s bursting with sweet apples, salty feta, and crunchy pepitas. There’s something about chopped salads that are just so much better than regular salads. I think it’s because you get a combination of flavors in every bite! The dressing can be made a few days in advance and it stores well in the fridge. 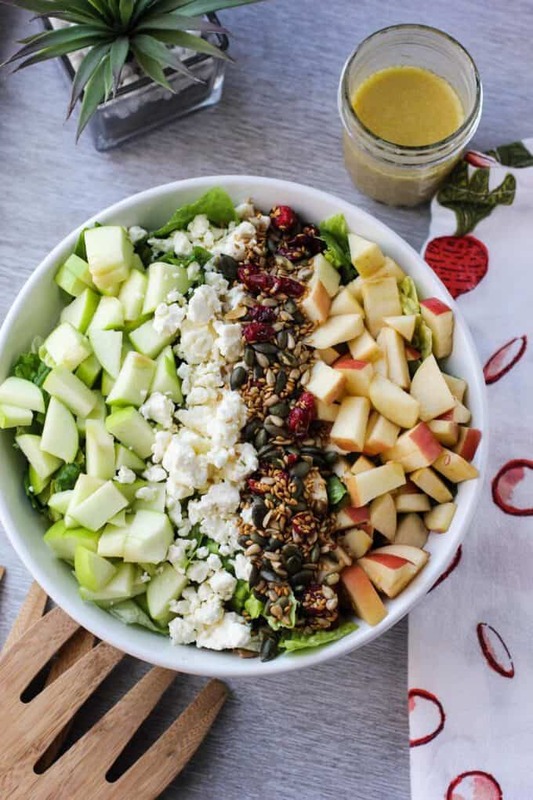 If you need to cut the apples ahead of time, toss them in the dressing after chopping. This will help prevent them from browning. If possible, wait to combine the ingredients until it’s time to serve. You don’t want the lettuce wilting since romaine should have a nice crunch factor. I like using apple cider vinegar in the dressing because it adds a lot of flavor without a lot of added fat and calories. Plus, apple cider vinegar has tons of great benefits! 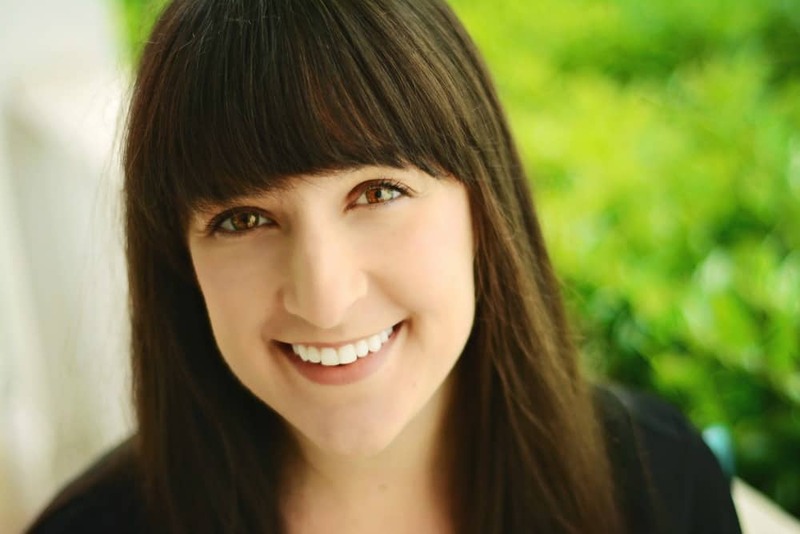 My friend Brittany wrote a whole blog post about it so if you’re curious about ACV, check out her post! 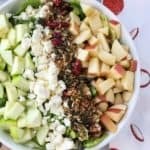 This chopped salad contains all your favorite fall flavors from sweet apples and tart cranberries to crunchy pepitas and salty feta. 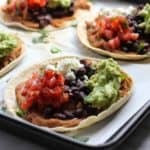 Try this for an easy weeknight dinner! 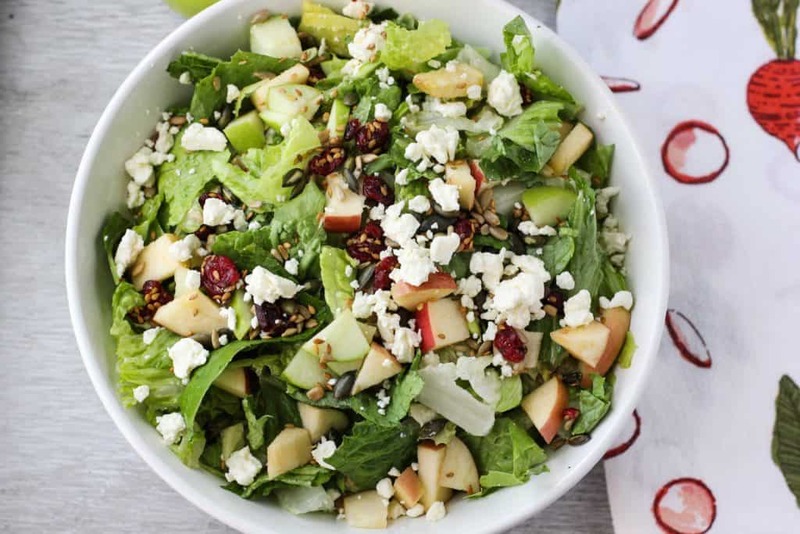 Combine the lettuce, apples, pumpkin seeds, cranberries, and feta. Divide into bowls then drizzle with dressing. You’ll likely have a bit of dressing leftover, depending on how much you like on your salad. I liked the combination of a tart granny smith apple with a sweeter fuji apple but if you only have one kind of apple, that’s totally fine. 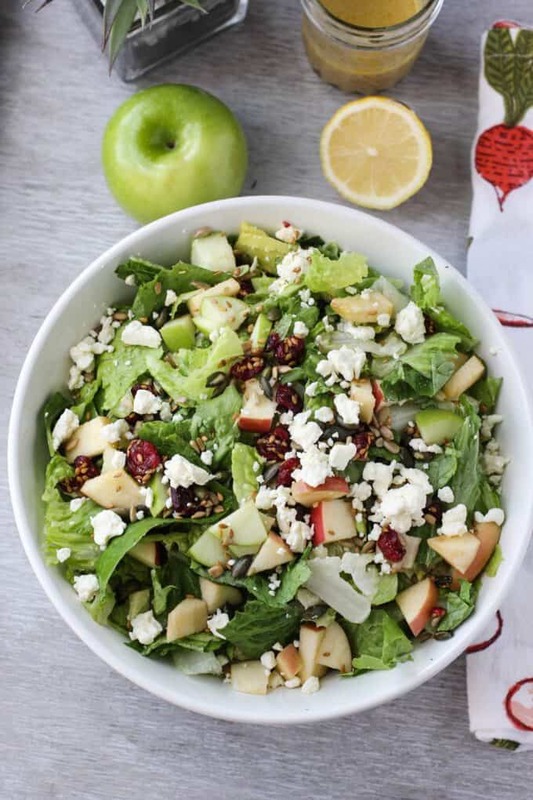 I’d recommend granny smith for the primary apple since you’ll get a bit of sweetness in the salad from the dried cranberries. What’s your favorite fall dish? 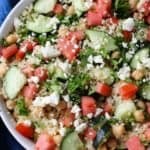 Love chopped salads like this, the ingredients are so gorgeous together for fall!! Looks delish! I will have to search for pepitas at our local grocery store. I love this combination of flavors and textures! 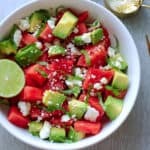 I love salads and am always looking for new recipes. This one looks delicious! But I never thought to add pumpkin seeds!